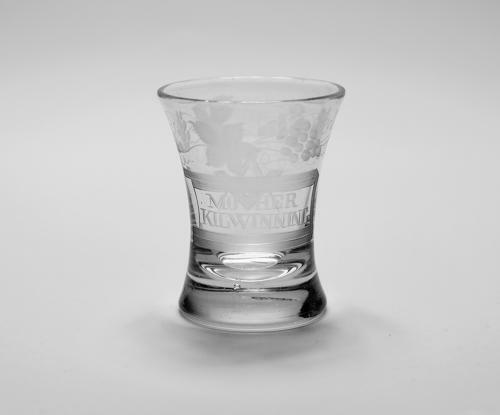 Small waisted Masonic tumbler engraved band of fruiting vine and ‘Mother Kilwinning’ within a central panel, the reverse engraved with Square and a set of Compasses. English Mid 19th Century. Condition: Very good with no restoration. Note: Lodge Mother Kilwinning is a Masonic Lodge in Kilwinning, Scotland, under the auspices of the Grand Lodge of Scotland. It is number 0 on the Roll, and is reputed to be the oldest Lodge not only in Scotland, but the world.